Rain gets heavy outside.Curtains are flowing getting the blow of winds around balcony.Thunders are sizzling,striking up above the sky.Amidst all those natural turmoil,Shivaay and Anika are looking at each other forgetting every damn thing. Unlike outside commotion,their hearts are calm to know all the unknown feelings floating and shimmering in those two pairs of eyes-blue and hypnotic. 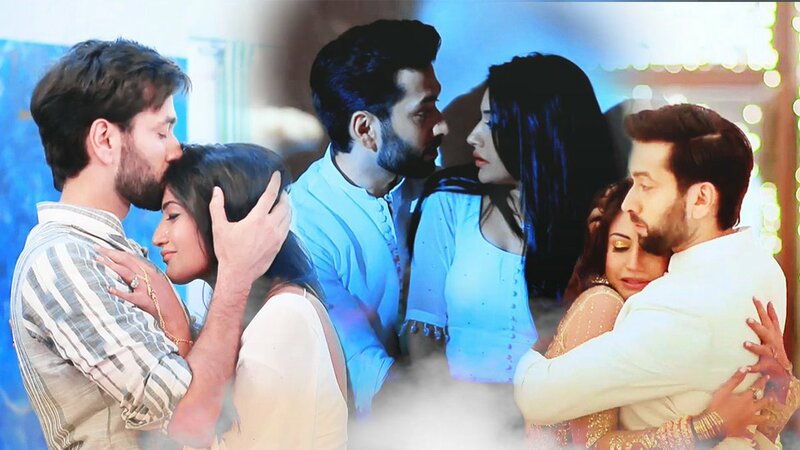 How long have been passed,there is absolutely no idea.Very suddenly,they stand up,leaving their seats,come face to face in a standing position.There is little distance in between them to cross.Anika’s dupatta is flying around Shivaay,touching him delicately.Those blink-less pair of eyes still staring. To interrupt that seemingly staring session,a bold thunder howls with all its power and strikes which produce a deafening sound. Fortunately or unfortunately,Anika startles and sense knocks in her.In return she gets extremely frightened.Her shoulder and face shudder and immediately she jumps into Shivaay’s arms who has stood right in front of her,taking his name aloud. There Shivaay was standing all numb,by senses when that happened.Neither he moved nor said anything.At present,Anika has thrown herself over Shivaay with all the force she could manage.Feeling those very particular feminine warm and soft touches,Shivaay’s freezing mode disperses and he turns into normal being.Eyes blink finally and he responds to Anika’s terrified touches.He puts his hands around Anika protectively with his chin on her head while holding her close to his chest. Cold rain-wind is brushing them but they are warm enough in each other’s arm. Anika:Woh,I am afraid of the sound of thunder.Let’s go inside.It’s quite cold here. Without waiting for Shivaay,she heads for the balcony door but stops taking few steps ahead.She takes a look over her shoulder.One corner of her dupatta got stuck in Shivaay watch,at his left hand.Anika turns and meets his eyes.Fixing his gaze on Anika,he removes her dupatta.Very slowly he lets go that off his hand.Anika turns her back and goes inside,leaving Shivaay behind. Shivaay:Anika,will you care to open the door now?What are doing in the room since evening?How long I have to wait?Either open the door or say something.Anika? Anika:Why are you getting so impatient Shivaay?I am opening it.But do you remember what I said to you? Shivaay:I am closing my eyes.Have closed.Now plz open the door.This suspense is literally killing me. Anika:Are you sure your eyes are closed? Shivaay:Should I sign some papers then you will believe Anika? Shivaay:Why have you blindfolded me Anika? Anika:Very simple.To give you surprise. Whole room is decorated with flowers especially with white and yellow roses except the king size bed. It is decorated with blue orchids.Lights are dim,sweet fragrance is filling every corner of the room.Two big bowl with floating candles are placed on the dressing table,a small one in between darkening that area which is reflecting in the mirror glass. In the bed,there is made a big heart with rose petals. Floor gets covered with the same.Two soft downy pillow are kept at the head of the bed under orchid bower.Long stems of tube-roses and pink roses are placed on flower jars on two bed side table,surrounded by small glass candles. A completely beautiful,romantic ambience has been created in the room which is looking heavenly beautiful.But,where is Anika?Shivaay calls out her name.There,she pats his shoulder from behind.Shivaay turns immediately. Casting a glance at Anika,Shivaay gets mesmerized and equally stunned.Anika is standing,beaming ear to ear,wearing a royal-blue chiffon saree with a matching backless blouse.Her eyes are smoky,a small black bindi is on her forehead while a silver waist chain is gracing her slender,slim waist.Both hands are full with matching bangles.The diamond locket of her mangalsutra is shining and she stands with a downcast eyes,playing with the pallu of her saree.Greek goddess of beauty-Venus,she is looking in that get-up. Anika:Thank you.And did you like the surprise?Exclusively arranged by your wife,for you. Shivaay:Surprise is really sweet.You have decorated the room really in amazing way.I am impressed. Anika:Can I have a dance with you? Shivaay twirls Anika around.Their dancing moves are quite perfect,matching the rhythm of each other. Anika is looking at Shivaay,at his seductive captivating blue eyes,keeping her hands around his shoulder.Does goes on without any interruption. Shivaay gathers Anika in his arms,backing her.He stretches her one hand trailing it with his,other one rests on Anika’s waist holding her other hand.Nuzzling with her face he leaves Anika only to lift her in his arms.Taking Anika in his arms,Shivaay heads for the very well decorated bed.He places her in the middle of the heart,made of rose petals. Anika arches her back a little lying there.Shivaay joins her supporting himself with an elbow while lying. He gathers a hand-full of petals and showers those on Anika.One petal gets stuck in her rosy,velvety lips.Tracing the tip of his thumb on her lips,Shivaay removes that petal bringing his face very close to Anika.Her bangles make sound as she stretches her hands across the bed.Shivaay lies down next to Anika.Looking up,he takes Anika’s right hand in his hands.Taking a close look,he starts removing her bangles,one at a time. Finishing that task,he leans over Anika and brings her over him putting his hands on her back.Anika’s hairs fall on Shivaay’s face while he keeps her both hands on his chest.Lowering her forehead,Shivaay puts a soft wet kiss there.Anika shivers and clutches his kurta under her grasp.He makes Anika lie down next to him.His hand finds the curve of her waist and slides his hand under the transparent cover of her saree,takes the hook of her waist chain then removes it off her body. There Anika tosses her head lying on the silk bed sheet as her one leg arches up.Closing eyes,she turns to other side.Shivaay’s finger reaches for her almost bare back.He starts playing with the strings of her blouse.Anika clutches the bed sheet beneath her in tantalizing sensation,feeling Shivaay’s finger on her flesh. Shivaay undo the those strings there Anika’s breathing turns erotically quick as she lets out a soft moan escape her lips. Holding her right arm Shivaay turns Anika to him and her boss*m gets hit against his strong muscled chest.Their eyes meet,hot breathing is brushing their faces respectively.Anika makes Shivaay hold her bare waist while she unbuttons his kurta using her fingers.Looking up,she kisses Shivaay at the corner of his mouth.Then,blushing she buries herself in the crook of Shivaay’s neck. Shivaay:Are you sure Anika,you want this? She nods in approval in Shivaay’s arms,hiding her blushing face.Gathering her in his arms,Shivaay puts Anika in the pillow.Taking the silk duvet he covers Anika and himself,completely. Anika’s bangles start falling down from the bed,followed by the long pallu of her saree and many more things next is to be followed! Precap:Shivaay is looking at a sleeping Anika in his arms,who is seen smiling very contently.